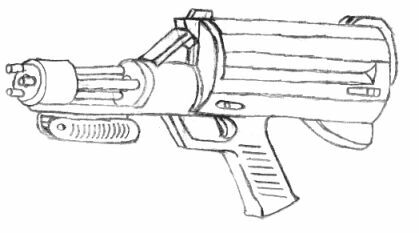 This weapon was originally designed by the leader of the mercenary company know as the "Texas Irregulars" for the techno-wizards in his mercenary company. The weapon quickly caught on with techno-wizards and other spell casters outside the mercenary company and now several non Texas Irregulars associated techno-wizards have begun producing the weapon. The submachinegun is prized because it inflicts good damage for a techno-wizard weapon yet has a large payload of energy blasts. While it is not the only techno-wizard weapon to have the ability to change magazines, the energy magazine does make the submachinegun far more flexible than standard techno-wizard weapons. In appearance, the Techno-Wizard Gatling Submachinegun is unusual. The weapon has three barrels that rotate whenever the weapon is fired. The weapon has a rear pistol grip and a folding fore grip under the three barrels. The fore grip is so the weapon can be held with more stability but is not really needed and the weapon can be used in either on hand or with both hands. The weapon can be fired at full proficiency with either the skill of Energy Pistol or Energy Rifle. Like the pre-rifts weapon know as the Calico, the submachinegun mounts its magical energy magazine on the top of the weapon. The weapon has a three position selector switch which allows one barrel, two barrels, or all three barrels to be fired simultaneously. The basis of the weapon are three barrels and associated equipment from the Wilk’s 320 Laser Pistol. The Wilk’s pistol was chosen because it is very lightweight yet has an excellent for a light laser pistol. The techno-wizard submachinegun retains the same range and the magic increases the individual barrel damage. When all three barrels are fired together, the weapon inflicts the same amount of damage as the Coalition C-27 Heavy Plasma Rifle yet weight less than half of the plasma weapon. Because the barrels of the T.W. Gatling Submachinegun share the same frame, trigger assembly, and other components, it is lighter than three Wilk' 320 laser pistols together are. The magazine makes the weapon slightly heavier but full loaded, the weapon is about the same weight as a L-20 Pulse Rifle. Without the top mounted energy magazine, the submachinegun has thirty shots total. This equates to ten shots per barrel and in that respect is identical to that of a standard techno-wizard laser weapon. The top mounted magic energy magazine vastly increases the number of shots available and stores a total of ninety blasts. The magazine can be quickly changed like a standard E-Clip and allows the weapon to be fired for a much longer period without the need for recharging the weapon with spells while in combat. Both the weapon itself and the magic energy magazine are charge the same weapon conventional techno-wizard laser weapons are. A globe of daylight spell and a energy bolt spell will give ten blasts. The spells are cast multiple times to recharge the weapon or magazine. The advantage is that this does not have to be done in the middle of combat once ten shots have been fired. The magazine was not designed to be used for any other techno-wizard but other techno-wizard laser weapons could be adapted to use the energy magazine. The magazine cannot be used with other types of techno-wizard weapons. Mega-Damage: 2D6 for one barrel (counts as one blast), 4D6 for two barrels (counts as two blasts), and 6D6 for three barrels (counts as three blasts). To Recharge: Cast Globe of Daylight and Energy Bolt (7 P.P.E. total) will charge the weapon or magazine with 10 blasts. Picture by Kitsune (E-Mail Kitsune).